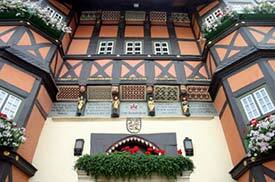 ABOVE: The Wernigerode Town Hall's half-timbered façade. INSET BELOW: A restaurant in Wernigerode's old town. The Harz Mountains have been a region of forests, myths, and literary legend for centuries--and Wernigerode, a town of 34,000 in the foothills of the Harz, has long been a popular gateway to Northern Germany's most mountainous area. The town, which dates back to 1121, was virtually unknown to tourists in 1777, when Goethe visited and wrote about the region. By the 19th Century, other German novelists and poets were following in Goethe's footsteps, and by the early 1900s, Wernigerode was achieving renown as a spa and vacation resort. The word "picturesque" is much abused in travel writing, but it's an adjective that fits Wernigerode perfectly: The narrow streets of the old town are lined with half-timbered houses in the Lower Saxon style, and the Rathaus on the Markplatz (see photo at top of page) hasn't changed much since its last rebuilding in 1544. But the medieval town center isn't Wernigerode's only claim to fame. It also has a hilltop castle, Schloss Wernigerode, and is the starting point for the Harzer Schmalspurbahnen (a.k.a. the HSB Harz Narrow-Gauge Railroad), which has a fleet of 25 steam locomotives and operates trains year-round to the Brocken, the highest mountain in the former German Democratic Republic and the centerpiece of Harz National Park. Wernigerode attracts nearly 750,000 overnight visitors and two million day tourists per year--most of them German, with a healthy sprinkling of Dutch visitors. Only about 9 percent of Werigerode's guests are British, and barely 3 percent are American. Still, the town offers a warm welcome to English-speaking travelers, and it's a great place to visit whether you're coming for scenery, excursions, shopping, one of the many local festivals and concert weeks, or a romantic honeymoon. Wernigerode really is a delightful town, and I recommend spending at least one night in Wernigerode (and preferably more) on any trip to the Harz region of Eastern Germany. Top photo copyright © Andrea Seeman.